The Ruth Fell Wander Community Art Wall was created in 2002 to showcase novice artwork from local schools and non-profit organizations, as well as to give visibility to the various resources and services offered to the community. 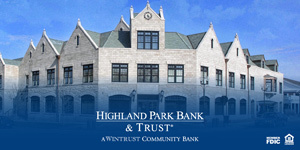 It’s located at the First Bank of Highland Park (1835 First Street, Highland Park, 847-432-7800, www.firstbankhp.com). Each month, First Bank of Highland Park extends a personal invitation to each artist and/or organization to attend a reception in celebration of their exhibition. Take a look at just a few of the organizations that have been featured.